An awesome company, Arm the Animals reached out to me to spread their message about supporting no-kill animal shelters. They create these awesome t-shirt designs with animals using weapons (hence Arm the Animals). I love how unique they are, and the reason behind them. With every shirt, an amount of proceeds goes to small, struggling animal shelters and other animal welfare organizations. 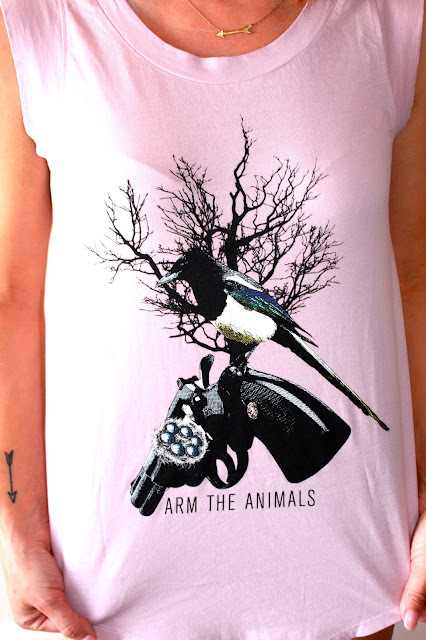 Arm The Animals creates killer T-Shirts that make a statement, raise awareness and generate funds for small, struggling animal rescues. We know we can't save every “at-risk” animal, but we CAN save some! By creating funny, unique, witty graphic T-Shirts and accessories, we know we can raise awareness about animal welfare AND make a difference by donating to shelters! So, every month we donate a very generous portion of every sale we make to reputable shelters - no matter what! Over the past 2 years we have been able to donate thousands of dollars to shelters and other animal welfare organizations; much of it has gone directly to our shelter partners. We also gave a $500 lump sum donation to Friends of Penny Min Pin Rescue this past month for winning our Shelter of the Month vote-off. So, in-short: Yes! We really do give a generous portion of proceeds to shelters. Since most of these shelters are smaller in size, this money really does make an impact for them and helps with food, vet bills, etc. and that’s exactly what we wanted to do. If you look for their posts on our Facebook page and Twitter feed, you will see all of their positive feedback toward us. We have great relationships with them and as you can see online, they are very grateful for our help. 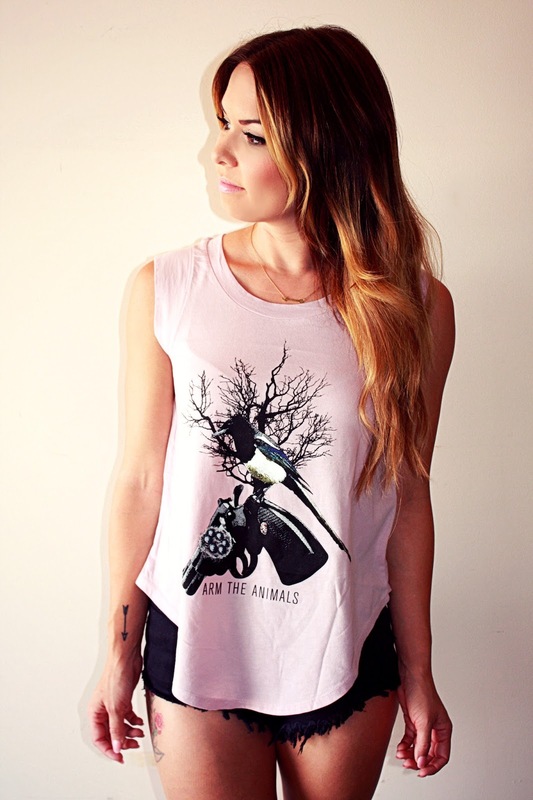 Arm The Animals consists of regular, down-to-earth people who actually care about the world around them. We are all close friends who grew up with animals, have rescue pets of our own, and agree that the current plight facing innocent discarded animals can not only be helped, but fixed! Is this naive? Maybe, but every “impossible” task has been overcome in the same way - by taking a first step! We are NOT a politically motivated organization, or a militant mob - We simply see a bad situation facing millions of innocent animals and want to help. Our goal is to assist as many small, struggling animal shelters/rescues as possible, and that is exactly what we are doing. It takes very special people to manage small "mom-and-pop" animals care organizations; often times these people surrender their homes, cars, social life, and finances for the animals they are helping. These people forego personal comforts and even basic personal needs to pay for vet bills, buy food, supplies, and anything else the animals in their care may need. This level of altruism simply blows us away, so we felt the least we could do is give these dedicated people a consistent stream of donations from every item we sell... We made this commitment and are sticking to it no matter what! Regardless of how we are doing as a company financially, we always donate as much as possible every month and always will. In no way is Arm The Animals is a "fly-by-night" idea or “one time” charity project; we have truly committed everything we have and everything we are to this company and we plan on doing for the rest of our lives. Although our goals are incredibly lofty, we have no doubt that we can make a huge impact! With passion, drive and your support, we believe anything is possible. We hope you feel the same way and decide to support us. Together we CAN make a difference... Actually, we already are making a difference.